1. In the bowl of a stand mixer combine yeast, 1/2 teaspoon sugar and 1/4 cup water heated to 115 degrees F. Stir to combine and let sit until frothy and foamy, about 10 minutes. 2. Add remaining sugar, milk, light brown sugar, vanilla, egg, and egg yolk. Beat with a wire whisk until well combined. Fit the bowl onto the mixer, with the dough-hook attachment. Add the flour and salt and mix on medium speed until the dough just begins to come together. Turn the machine on medium-high and knead the dough for 4 minutes. 3. Add the butter and continue to knead for about 6 minutes. The dough will the wet and sticky. Place the dough on a well-floured work surface, and knead about 1/3 cup all-purpose flour into the dough. Set the dough to rest in a large greased bowl. Cover the bowl with plastic wrap and a kitchen towel and allow to rise in a warm place for 1 1/2 to 2 hours, or until doubled in size. 4. While the dough rises, make the filling. Combine the sugar, dark brown sugar, pecans, walnuts, raisins, cinnamon, salt and cloves in a large bowl. Stir to combine. Stir in the maple syrup. Set aside. 5. When the dough has doubled in size, dump it from the bowl and gently knead in about 3 tablespoons of flour. Work the dough for about 1 or 2 minutes. Once it’s no longer sticky, place a kitchen towel over the dough and let rest for 5 minutes before you roll it out. 6. Using a floured rolling pin, roll the dough into a 10 x 10-inch square. In a small bowl, mix the cream cheese with a knife until it’s smooth and spreadable. 7. Spread the cream cheese evenly over the dough square. Fold the square into thirds like you would fold a letter to fit into an envelope. Take the open ends of the rectangle and fold into thirds again, to make a smaller dough square. Invert the dough so that the seam is face down and, using the rolling pin, gently roll it into a 10 x 20-inch rectangle. You may find that some cream cheese sneaks through. Be as gentle as possible with the dough but continue to work it until you reach the size you need. 9. Brush the top of the dough with half of the melted butter. 10. Pour all of the filling onto the dough. Spread evenly, leaving a 1-inch boarder at one of the short edges of the dough so the roll can be properly sealed. Lightly press the filling into the dough. 12. Cut cylinder into 8 equal slices. Nestle the slices, cut side up and evenly spaced in a butter 9 x 13-inch (light colored) metal baking dish. Cover pan with plastic wrap and set aside in a warm place to let rise for 2 hours. You may also refrigerate rolls overnight. 14. Make the icing: While the rolls are baking, whisk together the sugar and buttermilk in a small bowl until smooth. 15. 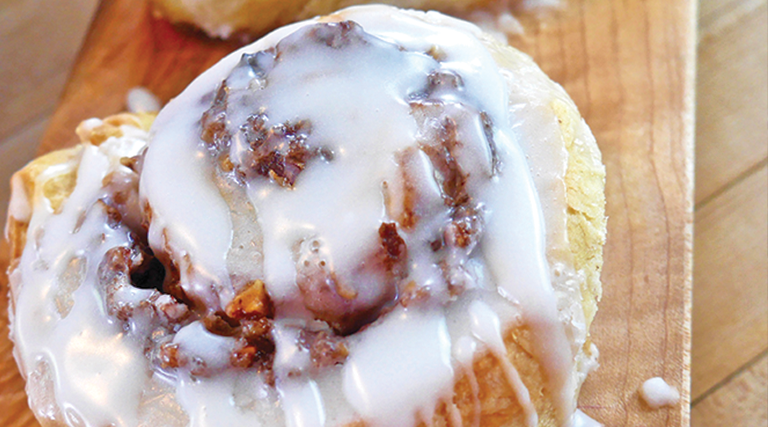 Transfer the pan of cinnamon rolls to a cooling rack. Brush with remaining butter. Let cool for 5 minutes. Dip the tines of a fork into the icing and drizzle over the rolls. Serve immediately.